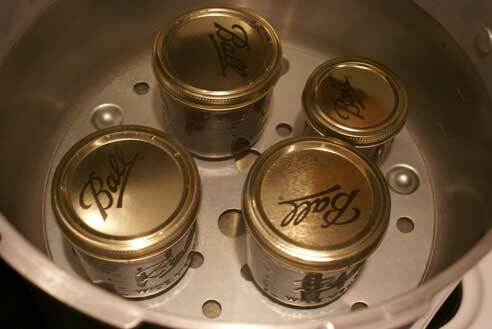 I made the “executive” decision to invest in some canning equipment…because I am the CEO in my kitchen. I have fallen in love with my garden…and have wildly elaborate plans for next year’s expansion…which I hope to put into place this fall, so it’s all ready to go in the spring! In order to preserve and protect my garden’s harvest, I thought it wise to start canning. I’m most looking forward to making salsa and spaghetti sauce. I’ll use the tomatoes from my garden, as well as from a nearby “you pick” market that practically gives the tomatoes away at the end of the picking season! In the meantime, I’ve made a few jellies, as the prices on berries have been LOW! Round 1…of hopefully many!!! Blueberry-Strawberry Jelly! hey, love your site! would you be willing to share your blueberry-strawberry jelly recipe? I’d love to hear your recipe and cooking times. I made raspberry jam so far this season. Oh I just did 2 whole posts on pressure canning! My Mom taught me how to do it this summer and I love it. I feel like I have so much more control! Welcome to home canning! It’s a lot of fun. Lately I’ve been making batches of zucchini pickles. My DH doesn’t like zucchini. Too many zukes for me to eat alone, so I figure that I might as well make pickles for a cold winter day. Congrats on learning to can. I love cannning! Every summer I can tomatoes, pickled veggies, and pepper jelly. Makes me feel a little secure to know I have food put away in the pantry. Stop by my blog and take a peek at my garden. i too have fallen in love with canning. i’ve made a bunch strawberry jam this season (because of the LOW prices at my store) and will soon be doing salsa, pickle relish, pickles and anything else I can think of. Makes for great food storage and saves tons of money in the end. Good luck with all your canning adventures!! I miss canning. I downsized to a condo several years ago and have no access to a garden nor the space to store the canning supplies or the finished products. What a great way to feed a family at little cost–except for the time and energy. Love to know what type of equipment you bought. I’m just coming around to the idea of canning myself so any info would be great. Thanks! Aww, I’m jealous, I’d love to know how to can! Next year for sure! I love canning. I grew up doing it all the time. I just spent the day picking cherries and making cherry jam. I made 28 half pints, not bad for one days work. Plus, they make great Christmas gifts. Last year I gave crab apple jelly. I also love doing peaches, and pears. Hey, I just read the post above mine and thought I’d share my cherry jam recipe. Combine cherries, sugar and lemon juice in large pot. Boil, stirring until sugar disolves. Stir in liquid pectin, Return to rolling boil. Boil hard 1 min. stirring constantly. 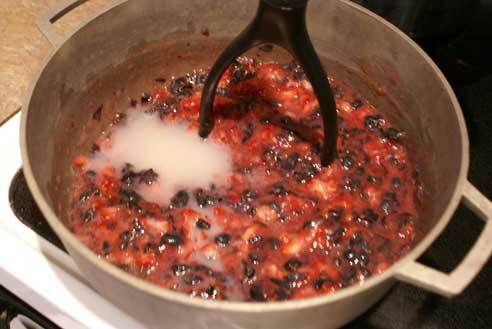 Remove from heat, skim foam if necessary, ladle into jars and process. ***I put red food coloring in to make it a prettier color. I figure with the free sour cherries and already owning my jars, it was about $0.68 per half pint. ** The Ball liquid pectin has a coupon inside for $0.50 off next pectin purchase. The Ball Blue book of canning is a great reference. Yum! I told my mom that I would like to learn more about canning so we might try some of that later in the summer if we can manage to squeeze it in!! I love canning! Welcome to the dark side!!! I love your adventures. This one caught me eye especially because I am looking for a freel template for oval jam labels so I can print my own. Would you know of a source?? I don’t Cathy! I was thinking the same thing as I was drying off the jars! Will see what I can find! I’m so excited to see your progress!! I hope to can salsa and spaghetti sauce this summer…please continue to share!!! I need to learn!!! Awesome! I’m planning to do some of that too this season – between our own garden and the “loss leaders” at the farmer’s market, it seems like a thousand pities NOT to be preserving all this good stuff for the chilly winter days to come. Thanks. The Ball Jars I bought came wth 12 on a 5×7 sheet but had no instructions for a Word template that would work with them. My handwitng is shakey so beijng able to print them on he computer would be great. Here are some templates that might work. Just choose what program you want to use them with. 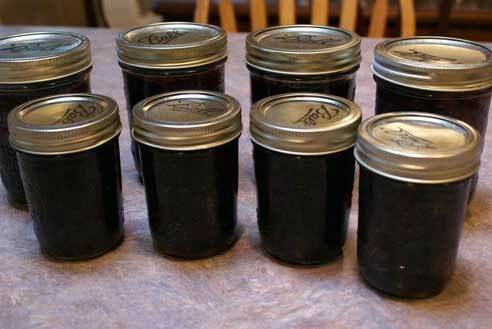 I have always enjoyed making jam, but my husband (the health nut) didn’t like how much sugar went into my jam. This year I switched to Ball’s No/Low Sugar Pectin and now everybody is happy! Great Alea. I’ve got a box of the no/low sugar pectin and plan to use it on the next batch! Thanks Jean! Jam it is! Your jam looks great! I made the same kind except I needed a little more fruit since the strawberries were from my garden, so I added some very ripe nectarines to the batch. It is so delicious! Enjoy your jam…we sure are! Followed you here from a link at Recipezaar.com where I am a forum host. I am also in Ohio, in Oberlin. 🙂 I’ve made blueberry jam with honey and very little sugar and pectin, with added chia seeds for body and texture. It’s thick enough it looks commercial. I am just doing freezer jam for now.I love to read about culinary adventures, it seems you have a lot of them! I too am interested in canning. I am going to try the jam recipe soon. I look forward to more recipes for salsa and spaghetti sauce too!! Wow, it’s like you read my mind when you blog lol jk.. I been interested in canning.. prob because I been home and I am a creative person, so this stuff is great for xmas gifts. Would you mind sharing the recipe for your strawberry/blueberry jam?? Deann would you be interested in sharing your apple butter recipe?? Peel, core, and slice apples to fill crock pot. Remove lid and stir well. Add sugar and spices. Cover and cook 3 more hours on low. Take off lid and cook on High for 1 more hour. This is such an easy recipe because you do just leave it- not messing with it AT ALL for 16-18 hours. I use this recipe with my biggest crock pot– so, smaller crock pots may need less sugar and spices. This is a recipe that we have canned in a hot water bath, frozen, or served fresh. We have really enjoyed it!!! I’ve never canned but I would love to learn how! I also love apple butter so I’ll definately be trying this recipe. What kind of apples work best?